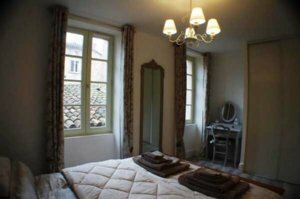 Apartment Saint Julien, with 1-bedroom and 1-bathroom, near the Sainte Cécile Cathedral and Berbie Palace in Albi, France. Apartment Saint Julien is a beautiful one-bedroom apartment of 50 square meters (500 sq. 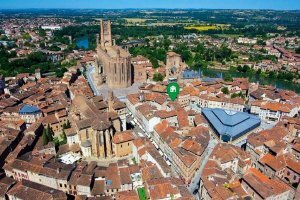 ft.) on the second floor (no elevator) in the heart of the city of Albi, ideally located for exploring the Episcopal City and its riches. This newly refurbished apartment (2016) has a spacious living room, which is very bright with two large windows that offer a beautiful view onto the Place Saint Julien. The brand-new kitchen is well appointed with an oven, induction hob, dishwasher, microwave and refrigerator. The bedroom has a king-sized bed (with quality mattress and linen). 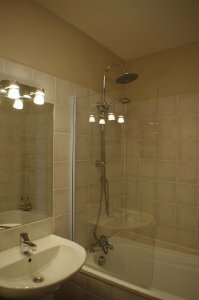 The bath has a bath/shower and there is a separate WC. 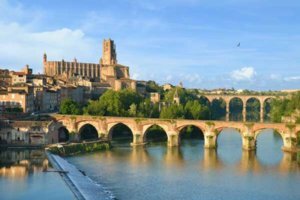 It is a quiet apartment, with very good insulation and ideally located close to the Saint Cécile Cathedral. 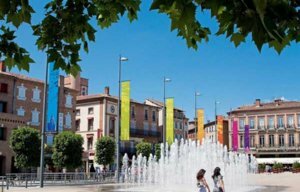 In Albi city-everything is nearby (historical center, restaurants, shops and entertainment….) It is a great place to be with so much to see and do. There is a large fee paying underground car park nearby (Vigan and Covered Market) and Day, Weekend and Week passes are available. There is also free uncovered parking less than a 5-minute walk away. The train station is located about 1 kilometer away. Linen is provided, and the apartment also provides a Baby Kit (comfortable travel cot & chair booster - 6 months to 36 months). Rates are in Euros (€) and there is a minimum 3 night stay. Rate is €85 per night and there is a 10% discount for stays of 7 nights or longer. Check-in is between 2PM and 7PM and Check-out is by 11AM. You must be able to climb stairs as there are three flights of stairs to the second floor.